Ethel Makila writes in New Agriculturalist about an African fund that is leading to breakthroughs and opening new frontiers in the continent’s biosciences research (photo: ILRI/David White). This month (Mar 2013), New Agriculturalist features an article on the Africa Biosciences Challenge Fund. This is a fund that is managed by a state-of-the-art biosciences initiative located in Nairobi, Kenya that is supporting African scientists in addressing key agricultural needs in the continent. This initiative is the Biosciences eastern and central Africa-International Livestock Research Institute Hub, better known as the BecA-ILRI Hub. ‘… [O]n average, only 0.3 per cent of GDP in African countries is dedicated to research and development, seven times less than the investment made in industrialized countries. . . . [S]ub-Saharan Africa (excluding South Africa) contributes only 0.6 per cent of the world’s researchers, a dismal representation from nearly 11 per cent of the global population. 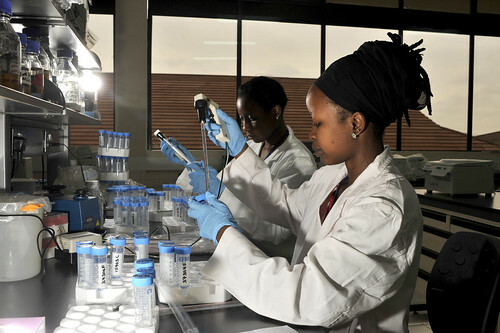 ‘Through this program, early career African scientists receive support for their research fellowships, pilot project grants and training developed in areas such as such as genomics, bioinformatics, diagnostics, molecular marker development and applications, DNA sequencing and genotyping, and technical and scientific writing. Charles Masembe, a Ugandan, was able to explore new frontiers in microbial science in the world-class facility only 500 kilometres from his home. Read the whole article by Ethel Makila, Communication Officer at the BecA-ILRI Hub: Leading the Agricultural Revolution from Within Africa, New Agriculturalist, March 2013. For more information, visit the Africa Biosciences Challenge Fund and the BecA-ILRI Hub websites. Tags: ABCF, Ethel Makila, New Agriculturist. Bookmark the permalink.